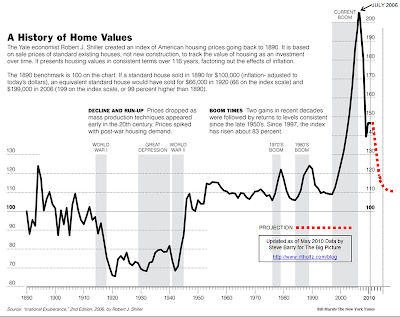 The chart below from Yale economist Robert Shiller, published in Andrew Sullivan's blog at the Atlantic Monthly After The Bubble - The Daily Dish | By Andrew Sullivan lays out neatly what happened in the housing bubble. It's difficult to read but the short version is that inflation adjusted since 1890, housing prices with a few short exceptions tend to rise about 10% over the years. Some of the exceptions were natural and easily understood - in the 1930's and through WW2, prices were depressed, then bounced back. During the 1970's and 1980's, they enjoyed a somewhat higher growth, but then in 2000/2008, there was a run-up based on nothing. The circumstances of the first part of this decade were always understood to be an irrational exuberance. Looking at a home that might have sold in 2000 at $185,000, its probable natural worth in 2010 would be about $240,000 given that the inflation in these ten years averages out to 2.5% per the consumer price index. 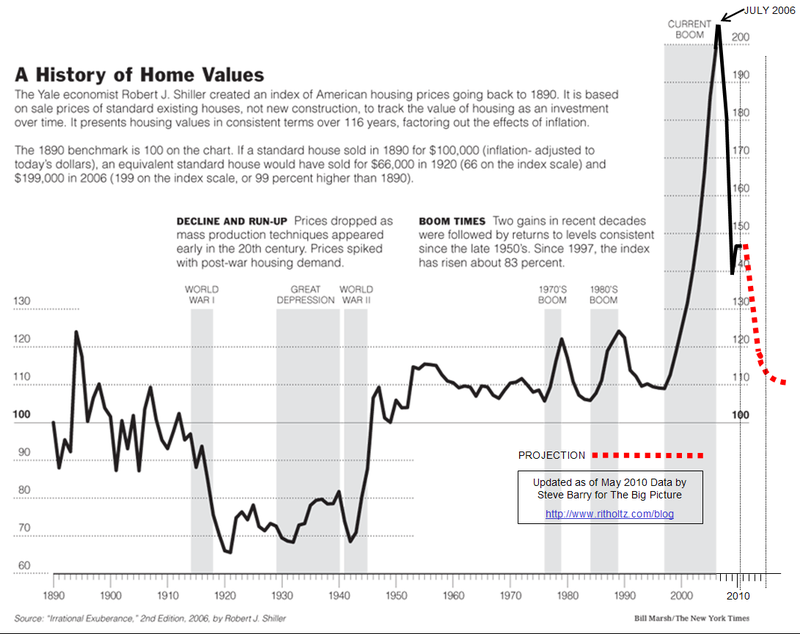 Using the chart above though, with 10% post inflation raises happening every year, that same house in 2008 had a perceived value of $410,000 – a $170,000 discrepancy. Real estate values on the small scale are not predictable, some areas get more valuable as different things happen, some less so, but overall the numbers show that the current property valuation, even with a 26% drop, is too high and regardless of an economic recovery, the reality is that North Bay Village needs to plan on having less money coming for years to come. Our city commission needs to stop spending money like water and start planning for the long term. Coming up: why North Bay Village lost more than most last year.